With a growing number of students opting for foreign degrees, education fairs are always warmly received among the young population. Open interaction and an abundance of instant information make these fairs much anticipated. 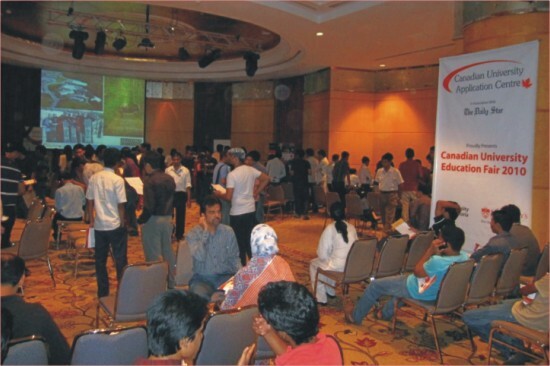 Canadian University Education Fair created quite a stir on November 5, a Friday, as students started to pour in from afternoon onwards at The Westin, all set to meet the representatives. 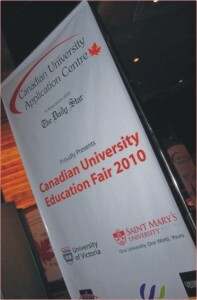 First of its kind in Bangladesh, the fair, an initiation of Canadian University Application Centre (CUAC), brought together five Canadian universities, offering counselling from choosing the right subjects to aiming for possible career paths. The five universities to take part in the fair were University of Windsor, University of Guelph, University of Victoria, Algoma University and Saint Mary's University. Representatives from these universities were ready for any questions or confusions. With each passing hour, queues dragged on longer and the crowd of students near each desk grew bigger. Dr. Majid Ahmadi, Director of Master of Engineering, University of Windsor stresses on the outstanding qualifications of the students who are eager to apply. Having dealt with students from Bangladesh before, he feels he has met the most promising pool of students this time around. He is confident that these students will have no problem whatsoever in getting admitted and settling down in Canada.The most sought after subjects, he observes, are Engineering, Business and Computer Science. Questions he had to tackle from students were about job prospects in Canada. Dr. Ahmadi points out that among the G8 countries, Canada has been least affected by the recession. The job market is still on the rise and those who had to wait for a certain period of time are fast curving out their own prospective niche. Since everything in Canada works on a point-based system, a degree from Canada would automatically increase job opportunities as well as chances of permanent residency, should a student wish to apply for it. Dr. Ahmadi adds that Bangladeshi students who attended the university on the Commonwealth Scholar scholarship programme have been extremely successful working in their respective fields. Moreover, attractive salary schemes have drawn more and more young graduates into working in Canada. Mel Broitman, Director of Canadian University Application Centre, has had enough experience working with Bangladeshi students to notice the number of quality students coming to the fair. The outreach had received a very positive response from both undergraduate and graduate level students. He also talked about how the questions from students are more sophisticated; they want to know more about the programmes they would fit in and the careers they lead to. Broitman elaborates that Canada gives access to things that few Western countries offer and it should be on the top list of every student aiming for a foreign degree. Marie Braswell from Saint Marie's University had been talking to students all day and she feels students here need the assurance that the programme they are choosing is the right one for them. Some are extremely well-prepared. Diversity in its programmes and its beautiful location will appeal to many young students, she hopes. Students at the fair ticked away their lists of queries. Many were seen sorting through the brochures hoping to find that perfect choice. Sarwat Zereen a recent BBA graduate from North South University is juggling the idea of applying for either MBA or MA in Finance.Her top choices are University of Victoria and Saint Mary's University as she has received good recommendations from professors at her university. She has chosen Canada knowing the quality of publicly funded universities. She also plans to work for sometime in Canada before heading back home. Azhar Rashid, an A' level student from Maple Leaf School has come to a decision; he wants to attend the BBA programme at Algoma University. Having searched thoroughly for the right university, he is confident that he has found what would suit him the best, especially after talking to the representatives of the university. Easy visa processing and affordable education have been the strongest deciding factors for him. Khadija Rehma, Senior Councellor of CUAC mentions that they have always organised seminars and school visits in Dhaka and the fair is first of its kind, having drawn an incredibly positive response from students. The organisers look ahead to more of such events in future.